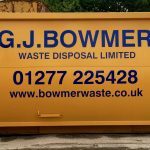 We provide a complete nationwide 24 hour asbestos disposal service. 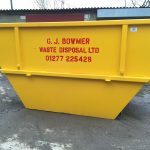 We offer a range of skips from 16 cubic yard up to 40 cubic yard enclosed containers. 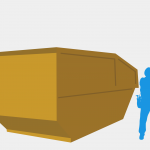 Many of our 16 cubic yard containers are certified for lifting by crane, and documentation will be provided upon request. 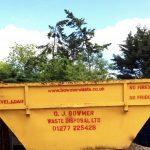 With our modern fleet of vehicles we carry two 40 yard containers or three 16 yard containers on the same vehicle, using a trailer. This enables us to run more efficiently, therefore passing the savings onto you; our customer. 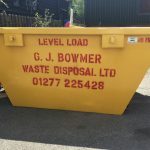 If you’re looking to dispose of smaller quantities of asbestos, G J Bowmer (Waste Disposal) LTD can recommend a tailor made service, to suit your requirements. 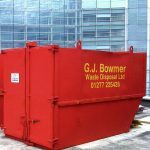 Whether it’s our unrivaled nationwide, 24 hours a day, 7 days a week van collection service; or our fully licensed asbestos transfer station. 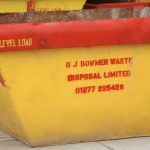 We deliver a personal yet professional approach and with over 30 years experience in the disposal of asbestos we provide unparalleled understanding and advice towards, and in the disposal of your hazardous waste. On collection of the asbestos we will provide you with all legal documentation such as The Hazardous Waste Regulations 2005: Consignment Note in paper form and also as PDF if required. Our clients include homeowners, builders, developers, health authorities, local authorities, housing associations and M.O.D. Government Buildings. 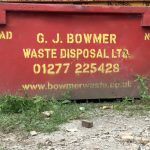 G J Bowmer (Waste Disposal) LTD have been members of the Asbestos Removal Contractors Association (ARCA) the UK’s leading association for asbestos removal contractors since 1988. Call and speak with one of our highly trained and friendly workforce, who are on hand to provide you with a quick, free estimate.